I keep hoping to find time to re-read Land of the Soviets and read Congo. One thing to keep in mind is that as colonial powers went, Belgium was one of the worst of the worst. So the attitude has to be taken in light not only of the time period in general but also that Belgium ruled the Congo with an iron fist and that the societal stratification was bad even from a colonial stand-point. Publisher's synopsis: Tintin goes to America, to Chicago, the territory of gangster Al Capone; the world of cowboys and Indians and the Wild West. Undaunted, Tintin and Snowy make their way through hilarity and danger to yet another triumph of virtue over crime. Comments: With the success of Tintin in the Land of the Soviets and Tintin in the Congo among the children of Belgium, Hergé was now able to realise his desire of taking his hero to North America. The author had been interested in the history and culture of the U.S. and, in particular, the proud Native Americans, since childhood. Although he had originally intended this story to function as an exposé of the oppression of the Native American Indians, his ultra right-wing editor at Le Petit Vingtième, Abbot Norbert Wallez, instead wanted a story about organised crime in Chicago, which would highlight the corruption in North American society. 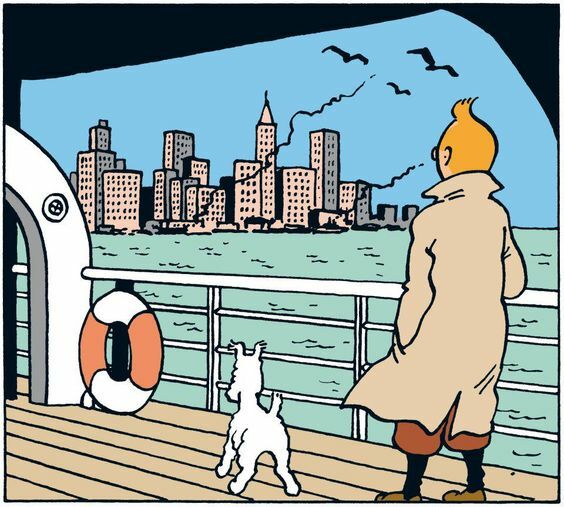 Ultimately, Tintin in America was written as a compromise between the two concepts, with the boy reporter beginning his adventure in Chicago, taking on the mob, before finding his way onto a Blackfeet reservation. 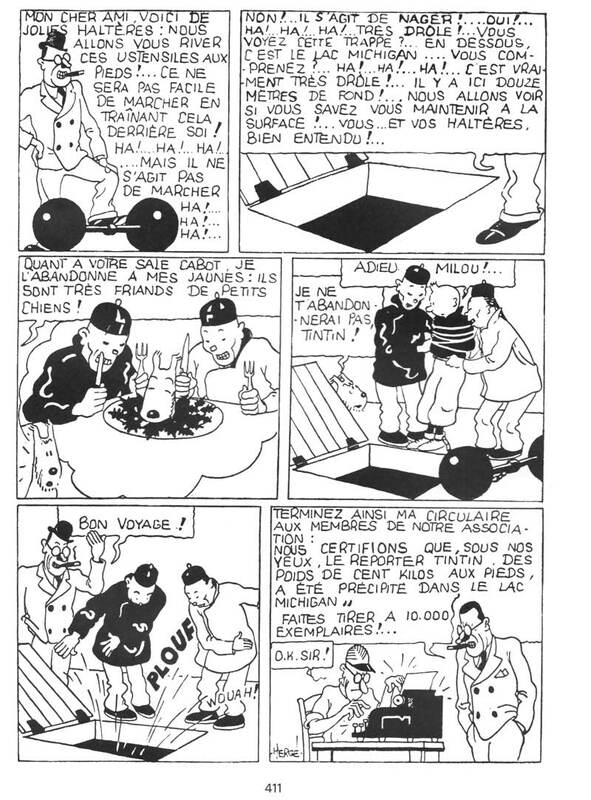 Tintin in America originally ran in the pages Le Petit Vingtième between September 1931 and October 1932, before being collected into a single volume in late 1932. 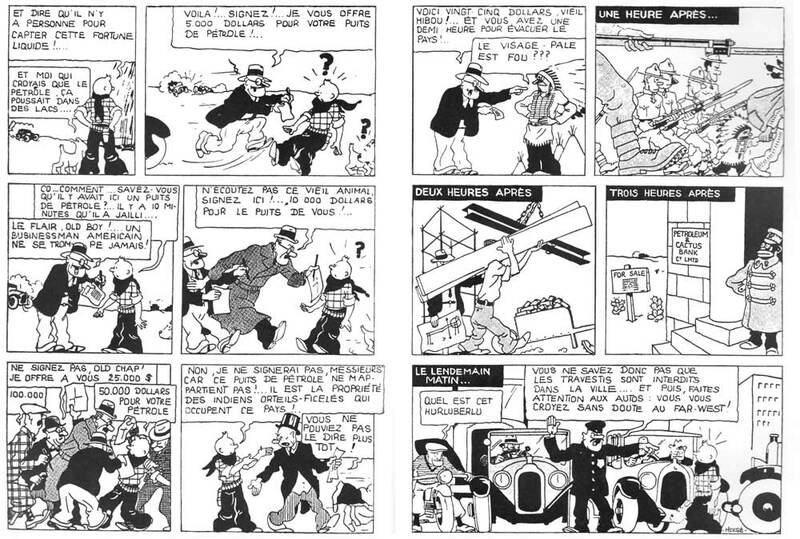 It was later redrawn by Hergé, with a number of minor changes, in the artist's more familiar ligne claire style as a full colour album in 1945. It is this commonly available, redrawn version that I will be basing my review on. The first thing that hits you about Tintin in America is just how much more confident it is than the first two Tintin books. Right off of the bat, the story is a lot more gripping than either Land of the Soviets or Tintin in the Congo, with the boy reporter and his faithful dog, Snowy, being abducted by gangsters before the end of the first page! There's also a lot more humour to this story – and this time the humour is actually funny – with amusing dialogue and visual gags aplenty. Simply put, this is the first Tintin story that actually makes me chuckle. 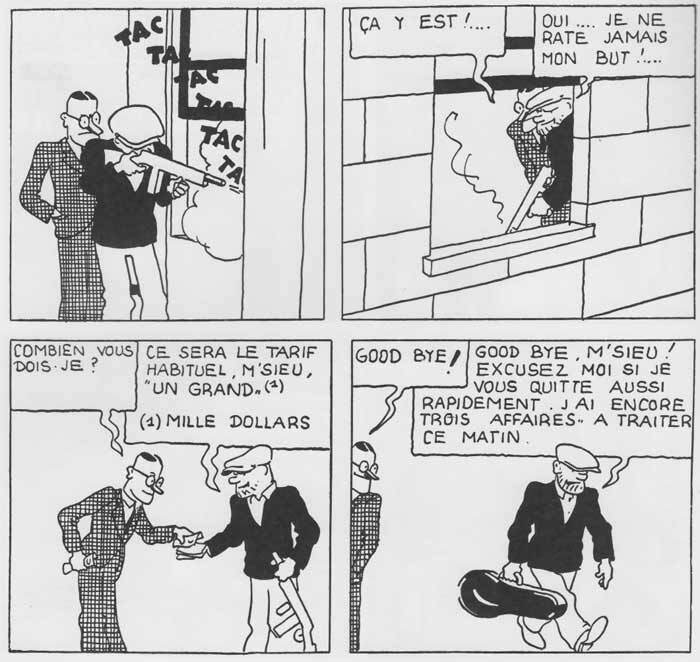 Of course, Capone himself was already in jail on tax dodging charges by the time that Tintin in America saw publication, but that didn't stop Hergé from featuring him as an antagonist in this story. Nevertheless, the pursuit of Smiles provides an excuse for a number of exciting incidents and escapes, and, in that respect, the character serves his purpose within the story well. He's also a much more three-dimensional villain than those who appeared in either Soviets or Congo, and I love the deliciously playful way in which he uses the names of famous American prisons like "Alcatraz" or "Sing Sing" instead of expletives. This colourful, prison-based language is not present in the original French language edition, however, and is something that the English translators, Michael Turner and Leslie Lonsdale-Cooper, added themselves. Regardless, I really enjoy it and, actually, if you give it a go yourself, "Alcatraz!" is a pretty satisfying expletive to say. There's some nice humour and social commentary in the fact that the sheriff collapses underneath a prohibition sign too. Unfortunately, Hergé erroneously refers to the Native American tepees as wigwams, which are actually a very different looking dwelling. I must say that the broadly sympathetic portrayal of the Native Americans that Hergé gives us – if we put aside his rather dated penchant for referring to them as "Redskins" – is, although relatively stereotyped, way ahead of its time. If you look at how America's native race was being depicted in contemporary cinema and books back in the 1930s, they were still cast as wild, ruthless savages, whom the "good guys" (i.e. cowboys and the U.S. Cavalry) had to kill. Hergé's take on the "Indian's" situation is much more progressive and nuanced, showing them to be an unfortunate people who had been pushed onto squalid reservations and were all too often exploited by the white man. This playful, but tremendously subversive, page arguably represents the most striking political statement that Hergé ever made in the series. Sadly, his message about the exploitation and destruction of Native American lands by the oil industry is every bit as relevant in 2017 as it was 1932, what with President Trump having recently given the go ahead to the controversial Dakota Access Pipeline, which threatens the lands of the Meskwaki, Standing Rock Sioux, and Cheyenne River Sioux tribes. While each of the book's three "acts" are individually fun to read and very nicely executed by Hergé, they don't really hang together to form a cohesive whole. The end of the book comes quite abruptly too, without any real sense of climax. In addition, there are remnants of the cartioonish violence that we saw in Land of the Soviets, in which Tintin survives explosions and a train wreck that should've, by rights, killed him. While you might feel that there's nothing intrinsically wrong with that in a comic strip adventure, this kind of cartoon-y violence is entirely missing from later books in the series and just doesn't feel very much like how Tintin should be to me. Although Snowy has always been able to understand human dialogue and "speaks" himself, none of the human's around him can understand what he is saying. To them, the dog's dialogue presumably just sounds like canine barks and whimpers. It's only the reader who is able to understand Snowy. This is how it was in Land of the Soviets and Tintin in the Congo, and I believe that Tintin in America represents the only time in the entire series that Tintin can actually communicate directly with his canine companion. Clearly, the boy being able to understand his dog was something that Hergé was experimenting with, but which was ultimately dropped. Overall, I like Tintin in America a lot. It has its shortcomings, without doubt, and I've outlined those above, but you know what? I really enjoy this book in spite of those shortcomings. It has a charm and a pace that is infectious, while the scripting and humour is much tighter than in the two previous adventures. This is also the first story in which Tintin's sleuthing side begins to come to the fore and he's even cheekily referred to as "Sherlock Holmes" at one point, by the head of a kidnapping gang. The book represents a leap forward creatively and, for me, it marks the moment where The Adventures of Tintin really take off. There would be better books later on, of course, but this is the earliest adventure that I would confidently recommend to a newcomer to the series. Even with its shockingly badly constructed plot, I defy anyone to lose interest in the narrative as they read. This book is a ripsnorter! I should just also note that, although Tintin in America does follow on loosely from Tintin in the Congo, it's not necessary to read that earlier book in order to enjoy this story. Indeed, for many, many years this was the earliest book in the series available in English speaking countries and I, for one, grew up believing that it was actually the first book in the series, rather than the third. Wow, bravo for this thorough and articulate review, Confessor! Great job! If people aren't interested in reading Tintin after this, I don't what what more can be done! Tintin in America is truly a huge improvement over the previous two adventures, both in terms of storytelling and artwork. That not all of the story's parts quite fit with the others is regrettable, but does not prevent me from enjoying it... In fact, it's a bit like watching those old serials where certain episodes sometimes veered far away from the previous ones. We were talking of political correctness on another thread, and one of my gripes with certain PC advocates is how they condemned Tintin in America for its supposed lack of respect toward American Natives, just as they condemned Tintin in the Congo for its racism. Say what??? Really? I mean, if this page is not a direct indictment of the way American Natives were mistreated here, I don't know what it is. (It's also one of my favourite comic-book pages ever). Tintin did move into a non-violent phase, didn't he? In later books like Tintin in Tibet and The Castafiore emerald, there isn't even a villain! We did get a few gunshots in Flight 714 to Sydney, though, and the (thankfully) never-finished "Tintin et l'Alph-art" would have included way too many scenes of criminals machine-gunning cars and characters. (I was actually shocked by the amount of violence in the unfinished pages of that book... as you say, overt violence and Tintin don't go that well together). I would have been tempted to attribute that to a coincidence, but since Rastapopoulos was introduced as a Hollywood mogul it makes sense to see him here. I'm just surprised that he didn't remember Tintin when they "first" met shortly thereafter in Arabia. (...) I, for one, grew up believing that it was actually the first book in the series, rather than the third. Well, as I remember it from my earliest days, It was indeed the "first" book in the series for over a decade, in the sixties. Casterman did not reprint it after the original color edition was out of print, fearing (probably) the backlash over its racist treatment of African characters. My father's younger brother had a complete set of the Tintin books, and Tintin in the Congo was not listed on the back of his prized possessions; it's only in 1970 or so that it became available again. As for Tintin in the land of the soviets, it remained the oddball and was never included in the official canon. I'll take a look at my French copy tonight and see whether the swear words are really things like "Alcatraz" and "Sing Sing". It doesn't ring a bell, but who knows? Characterwise I agree Bobby Smiles is not particularly memorable, though he is still a step up. More interesting in the derby hatted, cigar chomping detective Mike MacAdam who is clearly a sort of proto-Thom(p)son. One aspect that does seem very weird, as you mentioned, is Snowy's brief ability to speak intelligibly to humans. The experiment theory makes a lot of sense. It actually feels much more jarring for it to happen in this book, given how modern it otherwise seems, that had it been part of Land of the Soviets or Congo which definitely feel early. I could be wrong but I think The Broken Ear is the most violent of the stories were the violence is played seriously (and admittedly with some dark comedy) rather than for slapstick. It is a book with with four onscreen deaths after all. After that Hergé toned things down a bit. Agreed about the broken ear, rossn... We even see the souls of the dead bad guys be carried to Hell!!! I agree, I don't think there's really anything to get upset about in the depiction of the Native Americans in this book. Hergé's take on them is fairly stereotyped, yes, but it's also thoroughly sympathetic. When you compare it to the, frankly, insulting depiction of the Congolese natives in the previous book, it's like chalk and cheese. It's not the presence of violence itself in this book (perhaps I wasn't clear on this), it's the "cartoonishness" of that violence that feels so incongruous. Stuff like Tintin being involved in a high speed train crash and escaping without a scratch -- that's just a bit too Tom & Jerry or Mickey Mouse for me, and it's this kind of "silly violence" that would soon disappear from the series. I have no problem with Tintin and violence, per se. No, although Tintin remembered Rastapopoulos, saying "It's not the first time we've met" upon meeting him at the start of Cigars of the Pharaoh. That is presumably a reference to their encounter in Tintin in America. Cool. And please take a look to see if the Native American tepees are erroneously referred to as wigwams, as they are in the English translation. I'd be interested to know if that was Hergé's mistake or his translators. Yeah, the missing and lost dog and cat posters pasted onto the wall of the Grynde food factory is a deliciously dark touch. More interesting in the derby hatted, cigar chomping detective Mike MacAdam who is clearly a sort of proto-Thom(p)son. I hadn't thought of that, but it's a fair point. Hmmmm...interesting. Yes, that's a lovely panel. It's very understated, but, as you rightly say, wonderfully evocative. Tintin in America, you gave it 3 stars out of 5 and I'm thinking about getting it too based on the illustrations alone. 'Cause they've been ground to sausage meat in Dunderbeck's machine. With songs like that around, how could anyone think that comic books were warping kids' minds? In the French-language edition, the gangsters from Tintin in America do not use penitentiary names as swear words. I spotted a few "Tonnerre!" (thunder) and one "Mille ananas!" (thousand pineapples). The wigwam mistake is Hergé's; that's how the Black Feet's tents are called here. 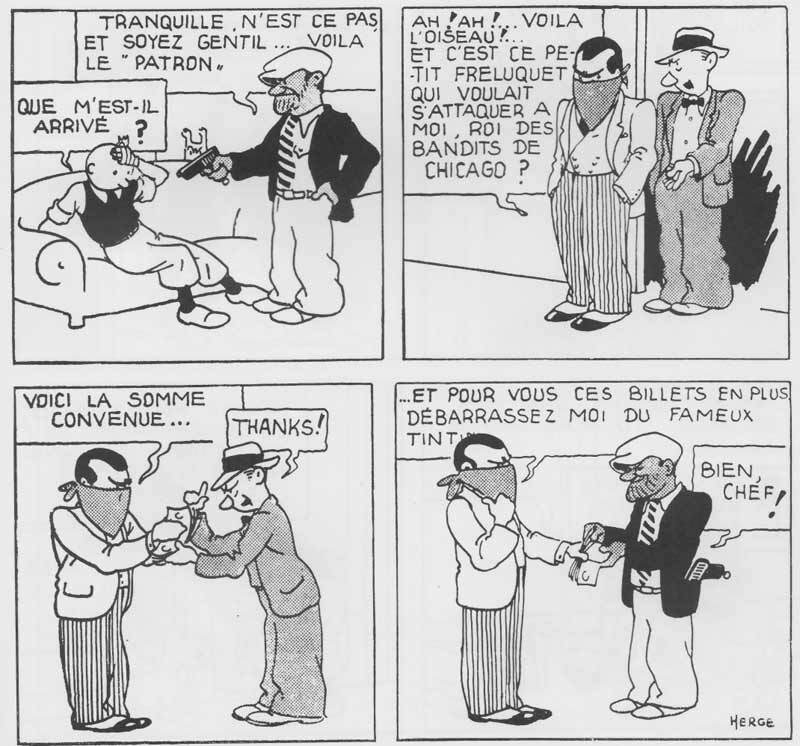 In The cigars of the Pharaoh, Rastapopoulos does not mention having met Tintin in Chicago. The first time they meet, on the deck of a cruise ship, Tintin prevents Rastapopoulos from hitting Professor Siclone. The angry producer shouts "You whippersnapper! Mind your own business! You have no idea who you're dealing with" and "One day, you'll regret having crossed my way: know that my name is Rastapopoulos!" Tintin thinks about it a moment and reflects "Rastapopoulos, Rastapopoulos...Ah, I know! It's that billionaire director from the famous cinema company "Cosmos Pictures"... Indeed, he's no ordinary Joe". When they meet later on, Rastapopoulos recognizes him from their earlier meeting, but not from their Chicago days: "But if I'm not mistaken, you were aboard the Epomeo, and are the one with whom I had that small misunderstanding?" So my guess is that the translators decided to mark the continuity between Tintin in America and cigars of the pharaoh. I really like Tintin in America. It's not perfect and Herge would produce better books later on, but there's something about this book that I just really enjoy. It was always one of my faves, in spite of its shortcomings. Glad that I'm gradually turning you on to Tintin, Juggernaut. My LCS has it and I'm using store credit to pay for it and should be in by the March 10th, the other two ... Destination Moon and Explorers on the Moon should come in together at the same time. I'm planning on reading Destination Moon 1st, followed by Explorers of the Moon, and finally Tintin in America in that order. Thanks for checking that, RR. I'm gonna update my review accordingly. I was checking wikipedia and apparently the Blackfeet/Blackfoot tribe are a real Native American Indian people though Redskin City is fictional. I guess this means at least part of Tintin's adventures probably took place in Montana. Yes, that's right. They're from the Montana and Dakota area, if memory serves. I had a great picture book all about the various Native American tribes as a kid that I loved, so I was well aware that the Blackfeet were a real tribe the first time I read Tintin in America. Just for kicks, I went and had a look at my old Archives Hergé to see how much the original version of Tintin in America differed from the updated version. I was very surprised to see that it was actually much cruder than I remembered! The story is the same, but was clearly entirely redrawn; furthermore, certain layouts and dialogs were altered. And in some cases that's a very good thing, because if you think Tintin in the Congo was racially insensitive, you ain't seen nothing yet!!! I couldn't help but bursting out laughing when I saw that! It's so... WRONG!!! No wonder the "Snowy as main dish" image was dropped from the updated version! What was Hergé thinking? The great page where oil causes the Blackfeet to be ousted from their lands was already there back in 1931, but took two pages instead of one. And rossn was right: that's indeed Mary Pickford at the banquet! Well-spotted, rossn! 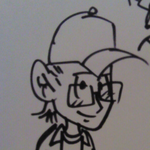 (Notice that the potential Rastapopoulos looks less like the villain here). One last interesting detail: Al Capone's face is not shown! The kerchief doesn't make sense in-story. I wonder why Hergé chose not to show the gangster... afraid of real-world repercussions?